After more research and study, two new papers have been issued providing new evidence for the presence of a massive planet at the edge of the Solar System. Dubbed as Planet Nine, it was initially proposed early this year, but there has been no direct observation of its existence. Due to certain alignments at the edge of our solar system, it is believed that this planet is 70 times more distant from the Sun than Earth, so technically making a direct observation is very difficult. Thus far, astronomers have pointed out several other potential effects that this unseen planet might have on the Solar System. 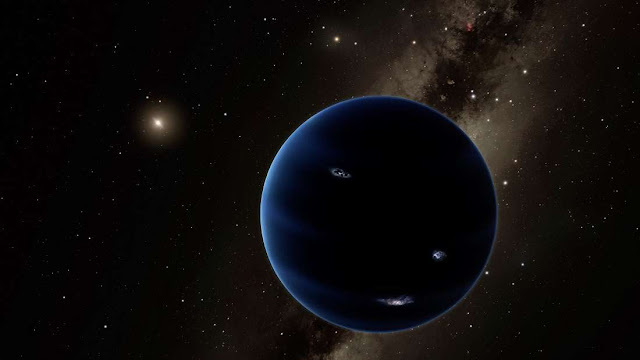 Now, astronomers from the California Institute of Technology (Caltech), along with the proposers of Planet Nine – Mike Brown and Konstantin Batygin – propose that the six-degree tilt detected in the Sun compared to the level of the Solar System is essentially affected by the pull of Planet Nine. Existence of an object no less than 10 times the mass of Earth, on such an extensive orbit, and with a projected inclination of 30 degrees will produce a wobble in the Sun. And these calculations of Planet Nine explain the observed tilt. The second study, issued in the Astrophysical Journal Letters, centers on a different piece of evidence. It seems that the trajectory of four minor objects in the Kuiper belt, counting the minor planet Sedna, are not arbitrary. The reason behind this cosmic ballet appears to be a gigantic object with properties very alike to what is projected for Planet Nine. We analyzed the data of these most distant Kuiper Belt objects, and noticed something peculiar, suggesting they were in some kind of resonances with an unseen planet. Our paper provides more specific estimates for the mass and orbit that this planet would have, and, more importantly, constraints on its current position within its orbit. It is not easy to detect a massive planet inside the solar system and astronomers suggest that it may take three or more years to finally observe it.